On October 19, 1974, The Woodlands celebrated its grand opening and the introduction of this new community to the Houston marketplace. Progress over the years has been achieved through the collaborative efforts of our employees, residents, governmental agencies, churches, civic organizations, financial institutions and business leaders who have chosen The Woodlands as a preferred location. Defining events as set forth in the following chronology have made The Woodlands unique and the achievements rather amazing. The more complete history is included in The Woodlands, The Inside Story of Creating a Better Hometown by Roger Galatas with Jim Barlow and is available in digital form on Amazon.com. Also, articles based on the book can be accessed on the History of The Woodlands page. George Mitchell purchased the Grogan’s Cochran Lumber Company land – including 2,800 acres that became the genesis of The Woodlands, marking the original transaction. An additional 300+ transactions were completed in order to assemble the original 17,455 acres. “Developing in harmony with nature” concept was established which emphasized the preservation of existing vegetation and a natural drainage system. First public school, Lamar Elementary, opened. Formal announcement of the HUD agreement to provide $50 million in loan guarantees. On September 6, $50 million in 7.1% U.S. governmental New Community Debentures were issued. The Arab oil embargo, high interest rates, and tight money period. 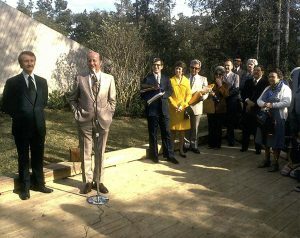 October 19, formal opening of The Woodlands. Real Estate Division completed its move to 2201 Timberloch Place. 10-year contract signed with the Houston Golf Association to host the PGA Houston Open. Jack Eckerd Drug purchased land and developed first distribution facility in Trade Center. In September, McCullough High School opened. Jamail’s, the first supermarket, opened. MEDC headquarters building under construction. Construction of The Woodlands National Bank Building. Houston Advanced Research Center constructed its initial building and announced plans for research campus. The Research Forest was established. Total investment in The Woodlands reached $1,000,000,000. Village of Cochran’s Crossing opened. Village of Indian Springs opened. Agreement signed to create a TPC golf course, designated as site for the Houston Open Tournament. Lake Woodlands filled with water. Harmony Bridge opened to provide an alternate route into Harris County. South County YMCA opened its new building. First Venture Technologies Building opened in The Research Forest. Severe economic downturn as energy prices collapsed and Houston market crashed. The Woodlands increased its share of the housing market. The John Cooper School opened. The Woodlands’ population topped 30,000. In April, The Cynthia Woods Mitchell Pavilion opened. #1 in new home sales and closings in Houston for first time. The Arnold Palmer Golf Course opened. Hughes Tool moved its world headquarters to The Woodlands. The Woodlands Community Association transition to resident control. Original $50 million of HUD debentures retired. Construction of The Woodlands Mall began. Formal announcement of Town Center. Town Center Improvement District formed. Cemetery and funeral home announced. Cochran’s Crossing Shopping Center opened. Population of The Woodlands exceeded 40,000. Opening of The Woodlands Mall. Grand opening of The Village of Alden Bridge. 6th consecutive year – #1 in new home sales in the region. Jobs in The Woodlands topped 15,000. Expansion of Cynthia Woods Mitchell Pavilion seating to 13,000. Ground broken for University Center Building. The Woodlands High School opened. Woodlands Parkway overpass across Grogan’s Mill Road opened. New Information Center opened on Woodlands Parkway. Tinseltown Cinema opened in Town Center. 1,053 new homes sold – new calendar year record and 1st time to exceed the 1,000 mark. 7th consecutive year – #1 in new home sales in the region. JCPenney announced as The Woodlands Mall’s 5th anchor store. Construction began on Alden Bridge Shopping Center. Announced 6-story 150,000 square foot office building in Town Center. On July 31, 1997 The Woodlands Corporation and all of its assets were purchased by a partnership formed by Morgan Stanley and Crescent Real Estate Equities for $543 million. The Woodlands’ 25th Anniversary is celebrated. Opening of Harper’s Landing, a community of 1,300 homes. Construction of The Woodlands Waterway begins. Town Center Two office building completed and occupied. Opening of Windsor Hills, “active adult” neighborhood. Resident diver Laura Wilkinson wins Gold Medal at Summer Olympics in Sydney, Australia. Branch Crossing Junior High School opened. Waterway Plaza One office building completed. All time record of 1,679 new home sales set. Milestone of 100 miles of hike and bike trails reached. Jack Nicklaus Signature Golf Course opened in Carlton Woods. Sterling Ridge Village Center opened. Opening of College Park Retail Center. Maersk Sealand’s 100,000-square-foot Customer Resource Center opened in the Research Forest. Opening of the Palmer Clubhouse celebrated. Waterway Plaza Two office building completed and occupied. The Woodlands’ new signature entryway completed. Lake Woodlands Drive extended over Lake Woodlands, to provide third major east-west thoroughfare. Gosling Road Bridge opens, providing connector to Harris County. The Gary Player Signature Course opens in the Village of Sterling Ridge. Opening of The Woodlands Waterway Marriott Hotel & Convention Center™. 800,000-square-foot Anadarko Tower open and occupied. Chevron Phillips Chemical Company occupies its new 200,000-square-foot building in Town Center. Coulson Tough Elementary School opens. The Club at Carlton Woods ranked “best new private course in Texas” by Golf Digest magazine. Population of The Woodlands exceeds 70,000. First urban residential projects open on The Waterway. CBI completes and occupies its new building on Lake Woodlands. Market Street “Main Street-styled” project underway in Town Center. Memorial Hermann The Woodlands Hospital’s $78 million expansion. St. Luke’s Woodlands Community Medical Center opens. The Samsung World Championships LPGA event played on the TPC. 53,000-square-foot clubhouse opens at The Club at Carlton Woods. New YMCA opens in Sterling Ridge. Construction of Indian Springs Village Center begins. Fazio Course announced in the Village of Creekside Park. December 31 the Rouse Company purchases Crescent’s 52.7% interest in The Woodlands.